The cover of this book has been grabbing my attention for months. 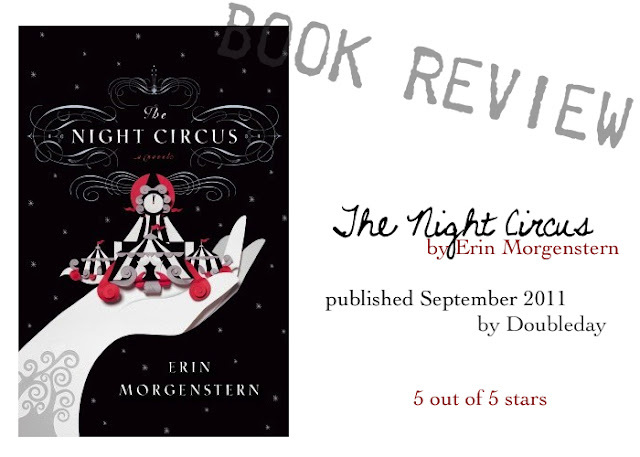 The synopsis didn't grab me right away, but I had also read Water for Elephants and was not a huge fan, so I was a bit scorned by the circus stories. This was nothing like other circus stories. This was nothing like any other stories at all. I started this book on audiobook. I HIGHLY recommend this audiobook. The reader had such an exquisite accent and voice. He was genuinely a pleasure to listen to. Also, I know this book starts off a little slow, so having it read to you in such an appealing voice helps to make up for that. I have to admit, less than halfway through, I had to get the actual book from the library because listening to it in the car was just not enough. This is probably the best writing I have encountered in any book, anywhere. Morgenstern is an artist. She paints such a magnificent dream with her writing. This book was not a story. This book was an entire world within itself. This was something to immerse yourself in. This is the kind of story that feels like home. Somewhere you can visit, escape to. Like a dream. I could not wait to get back to it. And when I was away from it, I couldn't stop thinking about it. I love that this book has a plethora of highly developed characters. I love that the romance is genuine and sweet without being overbearing or redundant. Well, after that glowing review, I guess I definitely have to read this one for my winter challenge! I just got this book on audio yesterday and NOW i CAN'T WAIT TO READ IT now that you've given it such a great review! I read this book about a year ago and it's always my go to recommendation when people ask if I know any good books. I will put this on my list! Wow! What a recommendation. Will put this on my list for next time I'm the library. You know what's funny? I didn't like this book very much! I was disappointed in the ending. I kept expecting something to happen and then nothing. I do know plenty who loved it, like you, though! Thank you for suggesting this book! I've heard about it but never really looked into it.